(Thornapple; Devils trumpet) Beautiful hallucinogenic plants from South America where they have a history of shamanic ritual use for divination, prophecy and sorcery. They are also used externally in the form of poultices or ointments for the treatment of aches, pains, arthritis, and rheumatism, All parts of the plant are poisonous if used improperly, especially if ingested. 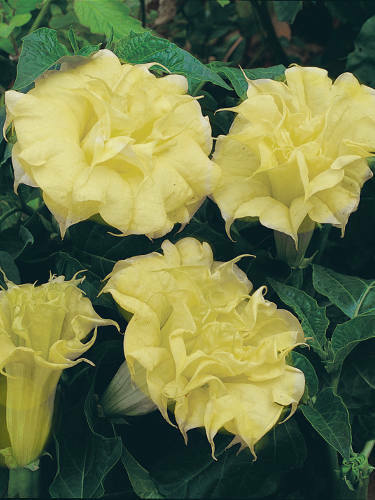 Angels trumpets are popular in containers for the patio, balcony or deck. Beautiful double orange-yellow upright trumpet-like flowers. Ht. 120cm/4ft.